Wyndor Sdn Bhd was established in Malaysia since 2004. Since then, our company has provided a one-stop solution for customers to purchase the door accessories at a higher quality but reasonable price. 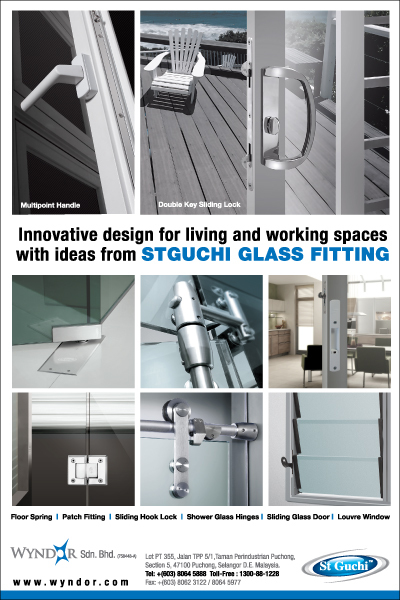 With our mission to serve our customers better, we offer extensive range of door accessories from different countries. The quality, of all WYNDOR products are constantly controlled in each production step according to WYNDOR Quality Control Program ranging from raw material to finish product. We manufacture our own line of aluminium products in a wide range of standard and various furnishing with a years pro-rated warranty. Aluminium is your best choice for strength, safety and style, as it is strong and fire-resistant and can be manufactured in multi functions. Our philosophy, is guaranteed customer satisfaction, meaning we guarantee our products to meet your intended purpose.